CONTEST: Join my Facebook page and become a FAN! 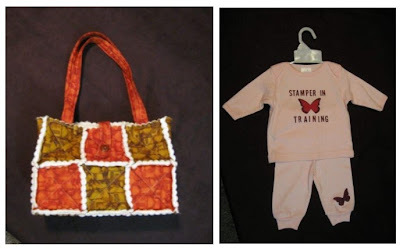 Want to get all my "Craftin' Caro" updates via Facebook? It's super easy... become a fan! Add yourself as a fan by Friday March 5, 2010 and be entered in a draw to win a fabulous new Hostess set: the 8 piece "Picture This" set from the Occasions Mini catalogue. Already a fan? No problem -- you'll be automatically entered in the draw on Saturday March 6th! 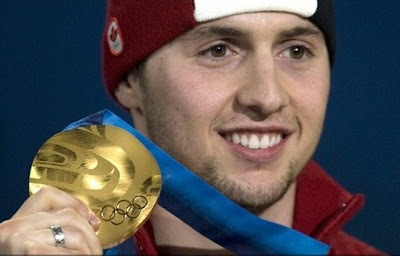 Please note that while anyone can become a Fan for my Facebook page, this contest is open to Canadian residents only == thanks! 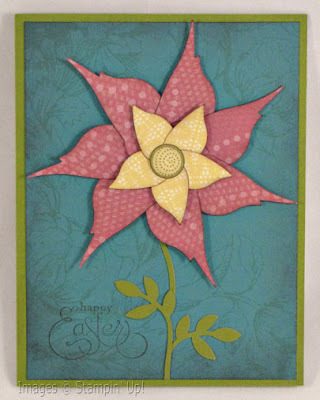 Still time for February's FREE tutorial! 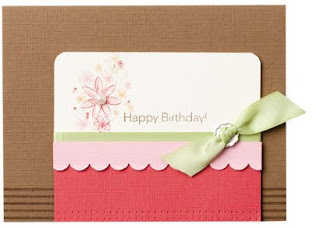 Do you want to learn how to make these 5 cards? 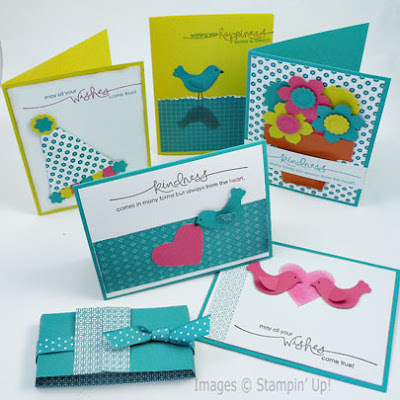 If you're in Canada, there's still time for you to place an order with me this month and receive a 22 page FREE tutorial that features the new Extra Large Two-Step Bird Punch and Sweet Pea Designer paper pack. 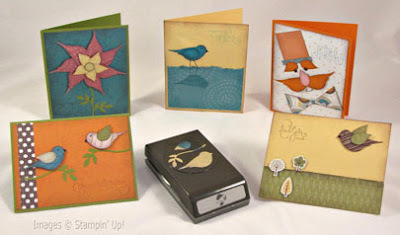 The 5 cards use the bird punch in both traditional and unique uses that will get your creative juices flowing! 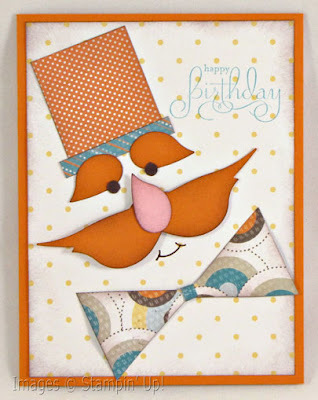 From serene reflections to silly clowns, this set covers the gamut so you can be ready for any occasion year-round. There's even a set of ALTERNATE card ideas included! Place your order now and receive this great .pdf tutorial to play with! 3 more Sale-A-Bration cards for Saturday... and Monday! 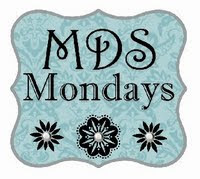 I've had a few people ask if I'd be willing to also have a Monday afternoon class for the Sale-A-Bration 10 cards class that I'm hosting on Saturday... and the answer is YES! 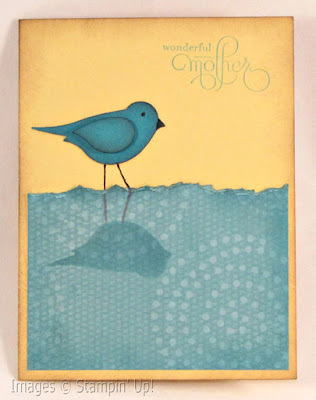 FYI... if the idea for this first card is familiar, it's because I CASE'd it from Shelli's blog. 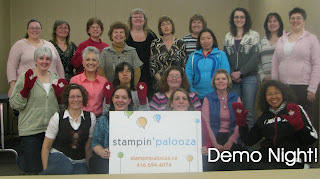 It was one of the M&T's she made for a "Workshop of a Lifetime" she demo'd at. I'm HUGELY excited to see Shelli when she comes to Markham next month and enjoy dinner with her -- I promise to take lots of pics!! Breathe a sigh of relief.. it's not too late! 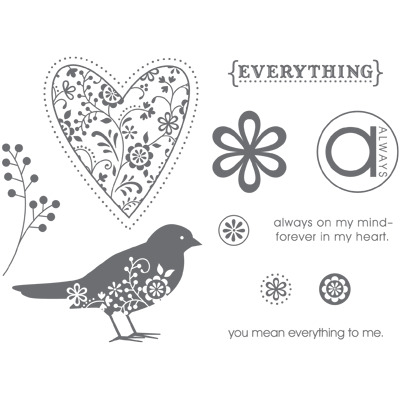 In case you missed out on a couple of favourites offered in our last Holiday Mini catalogue, Stampin' Up! has chosen to carryover several products so you can still get them now. This list of products (shown below) is available for purchase both through myself, as well as through Online Ordering. In addition, these products will be available in the next Idea Book & Catalogue! 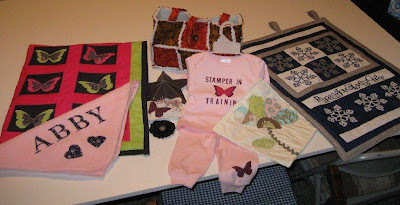 Here are a few of the projects we're making on Saturday as part of the Valentine's class I'm holding. 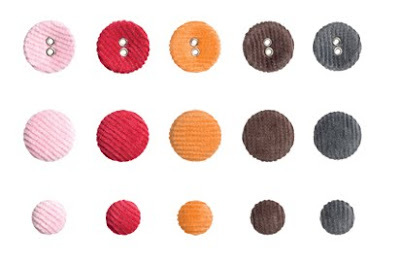 "Fox & Friends", and just threaded some black cardstock in through the red corduroy button! Candy treat container, loving that "Sending Love" DSP! I have 2 spots left for the 1pm class - please drop me a line if you'd like to attend! Join my Satin Ribbon Share! 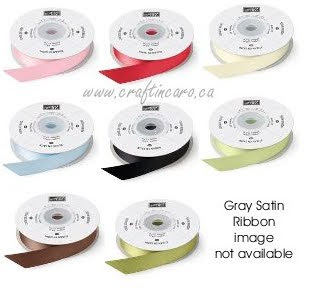 There are 9 beautiful new 5/8" satin ribbons being offered in the Occasions Mini catalogue, and they add a soft and beautiful touch to your projects. However, at $13,95 CDN a roll, it can be a bit pricey for you to invest in all 9 rolls. So I'm offering a SATIN RIBBON SHARE for you to take advantage of! I've already done the math, and can split each 15 yard spool in 5 groups of 3 yards each, for only $30 CDN (+ tax & SH) - you'll receive 3 yards each of all 9 colours= 27 yards. Want 2 sets of ribbons? Get it for only $55 CDN! Contact me today to join a share group and order your ribbon at this great deal! 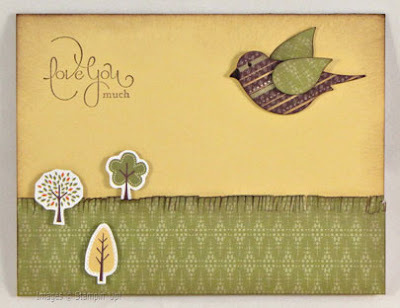 BTW, if you like product shares, check out my SWEET PEA DESIGNER PAPER share too! 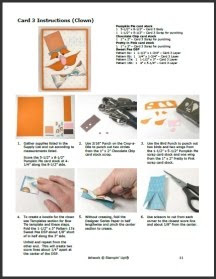 Receive this fabulous tutorial by email FREE with ANY order placed with me or paid class attendance in February 2010! 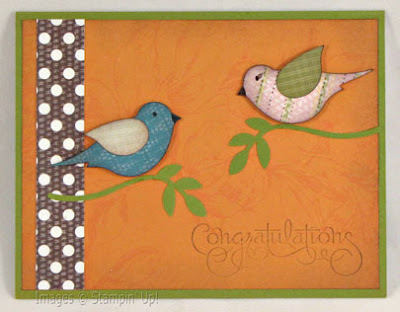 You will enjoy the adventure of creating unique and fun cards using the new Extra Large Two-Step Bird Punch. 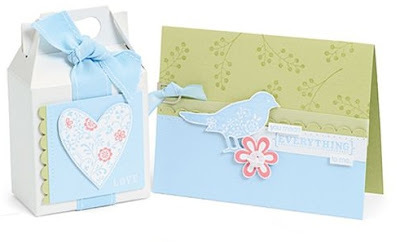 The cards feature the bird punch in traditional and unique uses that will get your creative juices flowing! From serene reflections to silly clowns, this set covers the gamut so you can be ready for any occasion year-round. 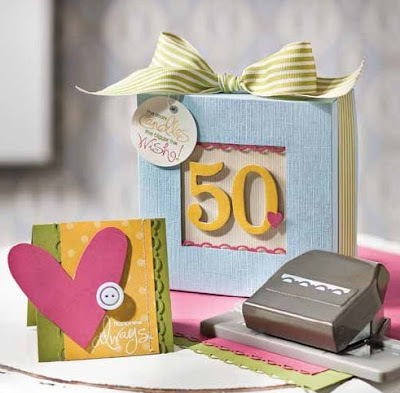 These projects feature the Extra Large Two-Step Bird Punch and the Sweet Pea Designer Series Paper Stack (DSP). The projects feature fun and colourful punch art and punch techniques that showcase the versatility of the bird punch. 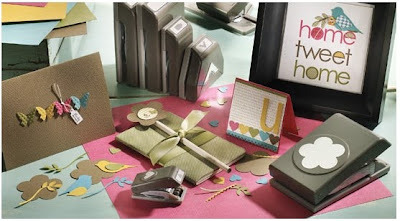 All the inspiration you will need to make beautiful and thoughtful cards year-round. FREE Blog Candy and my Sunday Sun article/video! You can imagine my excitement when I learned that a FULL-PAGE article about me was in the Toronto Sunday Sun this past weekend! 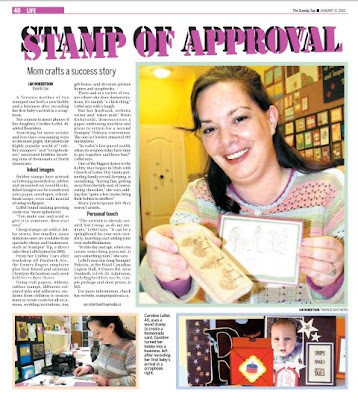 I had had Sun reporter Ian Robertson contact me and then come for an interview back in December, since he had heard about my Stampin' Palooza event from my friend Velarie and thought it sounded like a fun story. 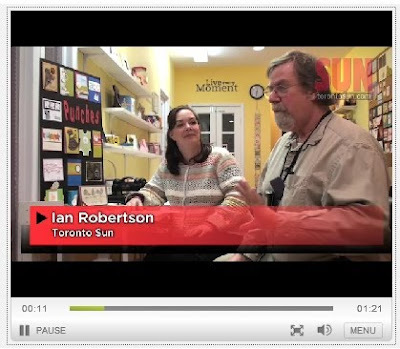 I'll admit that it was a bit of a thrill to have him come by the studio one morning as Christyne and I were preparing for a class, until the VIDEO part arose.. yes, he wanted to film our interview too. EEK! So go ahead and read the article, watch the video, and then let me know what you think by leaving a comment below! On Saturday the 6th of February, I'll draw from all the names and give away a free "Welcome Neighbour" Designer Paper pack to the winner. Easy peasy!